i don’t think that the end goal is to kill and maim. I believe that it is more of a show of force, and capabilities. I suppose it could be a show for recruitment also. And as for dangerous there is always a risk of danger in everything we do in life. If we get in our car and drive to a store, we risk getting into a car accident. Drive down the highway we increase that risk of it being fatal. You get the idea risk management. What about all the other air shows around the world should we boycott them as well, they perform dangerous stunts as well and yes some crash as well. That is the risk they take when they get in the cockpit. overall aviation is a pretty safe form of transportation. 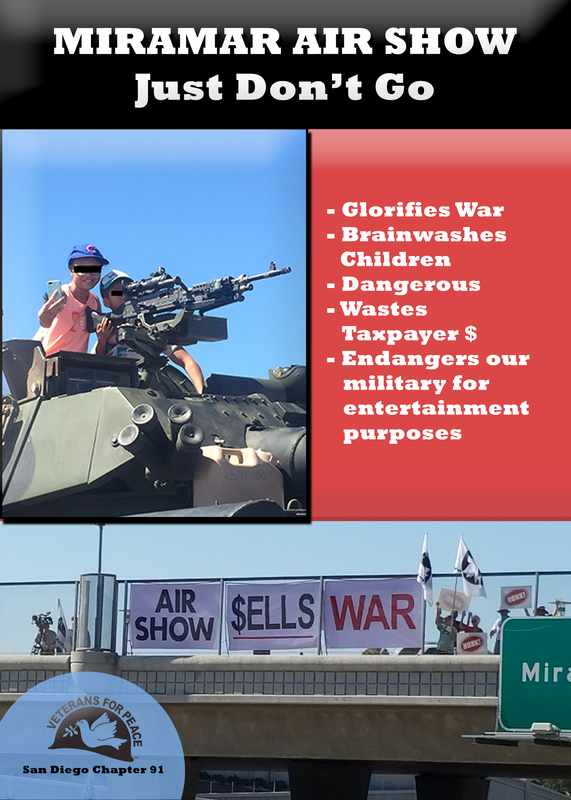 Why just boycott miramar? Military jets perform at a lot of different air shows as well. Sorry for the extremely late response. 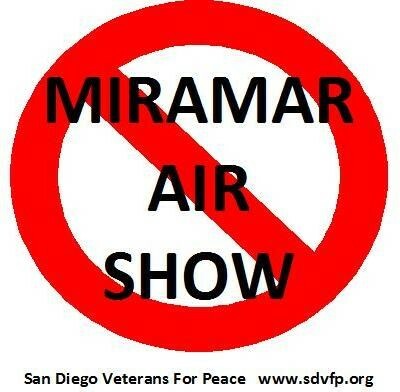 We are focused on the Miramar air show because it is the the singularly most participated in military industrial complex event of the year. 500,000 people attend and do so mostly because they fell patriotic and enjoy the display of force, as you wrote. However, what they really are doing is recruiting kids at a young age and pushing new weapons as a solution to our problems. As an example, you can watch this short documentary made by and independent film maker. http://www.tiny.cc/7bsuky Please note that when pilots climb into the cockpit to protect our way of life they do not use any of the stunts used at an air show. So basically we have them risk their lives to entertain the crowd. Now the contractors have pavilions right up front where they can sip mint juleps with our Congressmen and foreign buyers while the military pilots risk their lives to entertain them. I don’t think that is right, or acceptable. Please watch the film and let us know what you think again.